Being a gamer is not an easy task – the hardware is expensive and choosing a new machine can be quite hard. If you find the perfect PC for you the only thing that remains is the pleasure. After we have shown you laptops like Acer Aspire V15 Nitro, Lenovo Y50 and ASUS G551 it’s time to give some attention to the 17-inch offer from ASUS – the G751. Its performance is overall higher than the above-mentioned notebooks as the GPU inside is the fastest on the mobile market right now – NVIDIA GeForce GTX 980M. Computing power is also at the extreme – it is covered by Intel Core i7-4860HQ – one of the top models of the California-based company. … And while we are reading the specifications we see that the graphics card is really powerful and so is the processor but there are other curious specs you will not see in the standard sheet. This is the reason we got the G751 as fast as we could and we put test it. G751 comes in a big package containing the charger, very durable and luxurious-looking backpack, recovery disk, wiping cloth, cable tie, and manual. ASUS G751’s body feels massive, which is a necessity given it’s a gaming rig – the ultra-powerful components will not be able to cool properly in a standard laptop shell with reduced space. At the thickest point, the G751 measures 53mm and it weighs exactly 4053 g. Moving the G751 is not a thing you will want to do every day. If we don’t mind the size, ASUS G751 looks great, especially at the back. Huge exhaust vents located there are inspired by the American stealth fighter F-22 Raptor. We will check how efficient are they later on. If you place ASUS G751 next to Lenovo Y70, for example, you will be astounded by the size difference – G751 is not only over twice as thick, but also nearly twice as heavy. At the thickest point, the Y70 hit 25.90 mm on our micrometer and as we already mention G771’s profile is 53.00 mm. The weight of Lenovo’s model is only 2449 grams against 4053 for G751. But we don’t necessarily think all this is an advantage for the Lenovo considering G751’s hardware. The aggressive design signature of G751 is not only on the exterior, but can even be seen after opening the lid (in the center of which is the brightly glowing logo of Republic of Gamers). The keyboard has a red backlight and under it sits a huge trackpad (122.0 mm x 66.5 mm). The buttons of both components offer long and clear keystroke. You might notice the five buttons in the upper left part – the first is to start recording during gameplay, the second one is for Steam quick access. Next are the “m1”, “m2”, and “m3” macro buttons, that can be used to substitute other key combinations – this can be useful in games with combos like Mortal Kombat. The arrows in the lower right are separated from the rest of the keyboard so if you are using them you won’t accidentally hit a neighboring button (an unpleasant experience in some notebooks). The bottom of G751 is also intuitively structured – removing a flap with a hidden screw gives you access to the two hard drive/SSD slots and two RAM slots (there are two other hidden in the chassis), opening this does not void the warranty. To the right of the panel is the subwoofer, which gives us low frequency sounds (bass) when listening to music (we will cover this later). The battery is integrated into the chassis and is not made to be replaced by the end user. To the left G751 is equipped with a Kensington lock, two USB 3.0 ports, optical drive and a memory card slot (SD/MMC). To the right as follows there are combined S/PDIF, headphone jack, microphone jack, and audio-in, after them is USB 3.0 with Charger+ technology (for faster charging of mobile devices even when the laptop is turned off), another USB 3.0 port, MiniDisplayPort/Thunderbolt port, HDMI, LAN, VGA and charging port. The front only has five indication LEDs – power, battery, hard drive, airplane mode and NumLock. As we already said the back is covered by the exhaust vents. The display of ASUS G751J is an IPS panel by LG, model LP173WF4 SPD1. It is 17.3 inches in diagonal with matte finish and aspect ratio of 16:9. The resolution is 1920×1080 pixels, with 127 pixels per inch density and a step of 0.199 x 0.199mm. We give you a microscope image of a white screen. Viewing angles, that have nothing in common with the TN alternative offer nearly unchanged picture under 45°. We measured the maximum brightness before calibration – 337 cd/m2 with maximum deviation on the surface of 9% (neglectable). Color temperature before calibration is 7000K – slightly colder and after calibration (6535K) – very close to the optimal (6500K), but the deviation on two places was above acceptable. Contrast is high – over 1000:1. 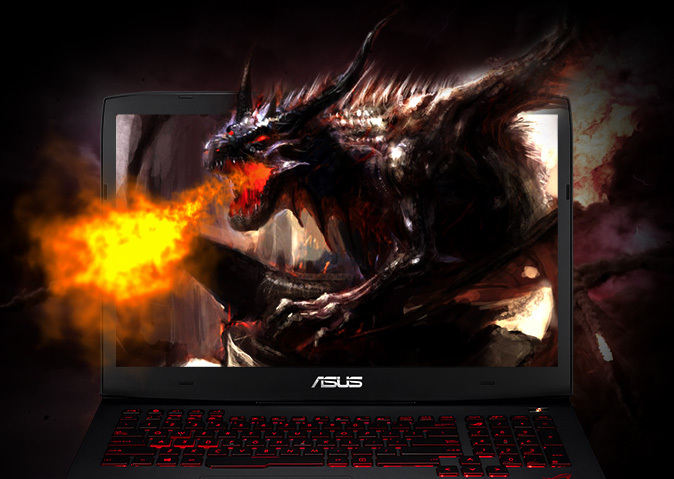 ASUS G751’s display covers 93% of sRGB and 72% of Adobe RGB color spaces. From the standard for Web colors there are two small uncovered strips mainly in green and red. The measured gamma curve has an insignificant deviation from the optimal, the image will have slightly higher brightness in areas of average ones. We managed to get exact colors after calibrating with two different devices. The average deviation (deltaE-1976) after calibration in the first case was 1.29. Deviation (deltaE) under 1.0 is hardly noticed with the naked eye, 2.0 is the limit which a professional monitor should not cross. We visualize the results with a digital color map. The display of ASUS G751J gives enough comfort thanks to its high contrast, brightness, viewing angles, with accurate colors after calibration and offers us long hours of work (gaming) without much eyestrain from screen flickering. One bad thing is the uneven (but not drastically) color temperature on the surface, but we are talking about a gaming rig not, after all and it’s not meant for designing. The frequency response from the loudspeaker of ASUS G751J shows a lower border frequency of 80-199 Hz, lower (better) than standard notebooks. As a whole the specs are tailored to the use – for gaming. Sound pressure is not very high. The technical specifications listed below are for the current model we’ve tested and may vary depending on your region. The battery included in our configuration comes with 6000mAh capacity. Its task is to power the power-hungry components and we will evaluate it thanks to our standard tests with Wi-Fi on, 120cd/m2 brightness and Power Saver mode. We got a very good result of 252 minutes (4 hours and 12 minutes). We tested the notebook for video playback with 720p HD movie. The 195 minutes of video playback is also a very good result, given the specs. To measure the 3D gameplay endurance we are using Metro: Last Light at minimal graphic settings. It is not surprising that the 3D gaming gives the lowest result – here G751 managed to give us only 109 minutes with one charge, which isn’t a very bad result. Intel Core i7-4860HQ supports TurboBoost (increasing the clock frequency when necessary), HyperThreading (additional virtual core for every physical one), PCI Express 3.0, DDR3L 1333/1600 memory, AVX, AVX2,FMA, Quick Sync and the SSE4 instruction set. Fritz is a chess benchmark which tests the computing capabilities of the CPU with various chess moves. The Intel Core i7-4860HQ in G751 managed to get 12.356 million moves per second. For comparison, one of the most powerful PCs, Deep(er) Blue, was able to squeeze out 200 million moves per second. In 1997 Deep(er) Blue even beat the famous Garry Kasparov with 3.5 to 2.5. *Tests were made with 1366×768 resolution for objective, comparison with GPUs in notebooks that do not support higher resolution. G751 and GTX 980M were not challenged by this test, but we thought it would be interesting to see what would happen in Full HD resolution and maximum graphics settings – we made the test with the heaviest of the three – Metro: Last Light and again the machine was not challenged and got an average of 41 fps. Drivers used are version 344.75 WHQL. We’ve already talked about our high expectations of the cooling system. At normal load the CPU cores temperature is 50-55 degree. During the 100% CPU load test, the temperature got up to 75-77 degree. We have to mention we checked the result after two hours at maximum load. The core clock in this test was 3.0 GHz with maximum TurboBoost for the four cores – 3.4 GHz. Along with the computational load, we added 100% graphics load and we left the PC running for another hour, going up to 3 hours in total. At the end of the 3-hour marathon the CPU got to a temperature of 89-91 degree – far enough from Tj.max (100 degrees) after which the system would automatically shut down to prevent serious problems. The core clock was 2.9GHz – 500MHz above the base while the GPU was running at 76 degree. The green line is the CPU load and the green – temperature. G751 did great on our temperature test where we measured the surface of the body. The temperatures you see on the graphic below are at the end of the 3-hour load test. The only drawback of the notebook are that the weight and size making it impractical for frequently moving around. But given the hardware capabilities all is forgiven.